This kit started with the new Moments in Time 6x6 Paper Pad (A pretty mix of vintage icons (Eiffel Tower, dress forms, birds) an a pretty palette of colors, too). 1 each of all 8 double-sided designs is in the kit. As that paper has a page of mixed dress forms I designed a couple mini sets of chipboard shapes with dress forms. The set in the kit is the Mini Paper Dolls Shape Set. It includes 2 paper dolls and 2 styles of dress forms. Plus some pretty new filigree (2 pieces, to make the top and bottom of a sign for your dress shop?). Speaking of chipboard: there a new set of Altoids Tin Facades (and one of the four is in the kit). And also a related 3D roof being announced today (that fits behind the tops of the facades (and is shaped to sit on an Altoids Tin)). 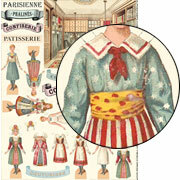 Back to the paper dolls: there are 2 new collage sheets in the kit. One of them (A Tiny French Dress Shop) includes clothes to fit one of the paper dolls in the Mini Paper Dolls Shape Set. Plus some text that can work as signage with the filigree pieces I mentioned above. 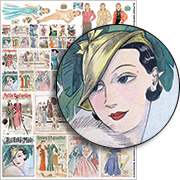 The other collage sheet is of French fashion magazines from (mainly) the 1930s and 1940s. Most are 1:12 & 1:24 scale. There are also larger versions that could work as posters inside a dress shop. It also includes some tiny clothes to fit the other paper doll in the Mini Paper Dolls Shape Set. Finally, some tiny strips of white Dresden: perfect for lacy borders. See the "We Also Recommend" section below for photos/links to the items in the kit that are also available to purchase separately. AND: all the items in the kit are On Sale, too! Artwork! See the newsletter announcing this kit! Kits are announced the first weekend of each month. However, if you sign up for a subscription, your kit will probably have already been mailed to you. A note on timing for subscribers: the kits don't ship till your automatic payment is made; the recurring payment date is based on the date you signed up for the subscription. If you'd like to make a 1-time "catch up" payment so that you'll be first in line to receive all future kits, contact Customer Service. If you buy a subscription after the 15th of the month, your first kit will be for the following month (so if you subscribe on October 16th, the November kit will be your first kit). Kits from previous months will be available for purchasing until sold out. And remember, here's a link to everything in this month's kit that is also available to buy separately. More coordinating goodies (and more info about the artwork) are in the blog post announcing this kit.